The New York student experience is like little else. You will meet new friends from all over the world, sharing unique life experiences alongside your study in a city which never sleeps. 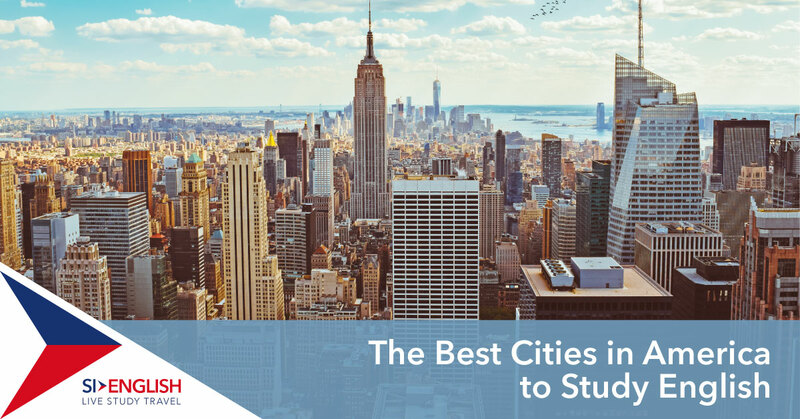 Having already look at some of the best activities to do while studying in New York, we now turn our focus to the best English schools in the city. English Language courses in New York are affordable for students of all backgrounds and, whether your goal is academic, professional or personal self improvement, you will be taking a huge step forward in your life. Use our 100% Free Application Service to apply today. What are the Best English Schools in New York? EF New York has a spacious 25-acre campus spanning landscaped gardens and wooded grounds with excellent facilities, including modern classrooms and multiple newly renovated lounges. Students also have access to an indoor swimming pool, fitness centre and dance studio! Where is it? The EF campus is 45 minutes from the centre of New York, allowing you the best of both worlds – being close enough to one of the most exciting cities in the world, but also having the space and freedom of a large campus away from the bustle of the city. EC New York was established in 2009 and is based in the heart of 'The Big Apple'. Every EC School is focused on improving your English, promising students a friendly learning environment, a high standard of teaching and student welfare, practical ideas and guidance for personal study outside lesson times and a varied social programme to complement your learning. Where is it? EC New York is in the heart of Manhattan’s Times Square and, with fantastic city views, the modern school is just a few blocks away from world-famous shopping on 5th Avenue, the Empire State Building and much more. Embassy English New York have highly qualified teachers which means study is made easier, while a busy social programme means no two weeks are ever the same - cheer at a Yankees baseball game one week and sing along to a Broadway musical the next. Where is it? You’ll live and learn like a true New Yorker at Embassy’s study centre in the heart of the city, extremely close to famous sights such as Times Square and the Empire State Building. If you are interested in studying at an English language school in New York such as EC or EF, apply with SI-English today. We can help you apply and guarantee you an offer letter from a school within 24 hours using our 100% Free Service.